It's not often you can get something like a soldering station for FREE, but with EasyBraid's Buy 4, Get 1 FREE promo you can do just that. 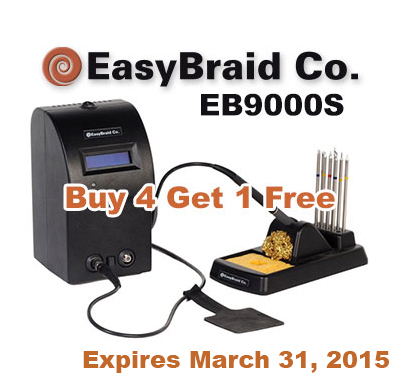 But, this great offer on their EB9000S Soldering Station ends TOMORROW, March 31, 2015. The EasyBraid EB9000S Soldering Station includes the SHP-1 Soldering Handpiece, the SHH-1 Soldering Handpiece Holder, an EBM7CH176 Soldering Tip Cartridge, the Power Supply, a RMP-1 Tip Removal Pad, a SG-1-GR Green Handpiece Grip, a SG-1-GY Gray Handpiece Grip, BC-1 Brass Curls, and a SPG-1 Sulphide Free Sponge. The EB9000S is available in 100-110 VAC and 220-240 VAC models. These stations feature Curie Heat Technology, excellent high-thermal recovery & performance, dual switchable soldering ports, no additional coil assembly costs, a 13.56MHz power supply with built-in LCD display, and no calibration. For further information, you may also contact Q Source by phone (800-966-6020), email, or via our Web site. Please also check out QSource.com’s complete line of EasyBraid products and accessories. Please note: Redemptions must be postmarked within 30 days of the distributor invoice date. FREE station offer expires March 31, 2015.